A selection of papers from current and former visiting fellows and other affiliates may be found via the e-Scholarship Repository. The Repository is an initiative of the California Digital Library within the University of California Office of the President. Working papers may be downloaded free of charge. "Mexico and the United States: The Politics of Partnership"
Exploring both policy and process, and ranging from issues of trade and development to concerns about migration, the environment, and crime, the authors of Mexico and the United States provide a comprehensive analysis of one of the world’s most complex bilateral relationships. The Center's publication division closed in 2006. 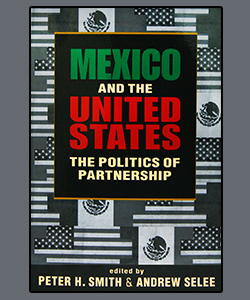 Prior to that, USMEX had published more than 150 titles. Its peer-reviewed monographs and anthologies meet the highest academic standards and continue to make a substantial intellectual contribution to literature on Mexico. Hard copies are available at Lynne Rienner Publishers Inc., the exclusive distributor for most Center publications still in print.